As long as the Earth can make a spring every year, I can. As long as the Earth can flower and produce nurturing fruit, I can, because I'm the Earth. I won't give up until the Earth gives up. For the past few days I've been mulling over different ideas for a blog post and coming up a bit short. I have lots of thoughts swirling around, but nothing I feel like really fleshing out into a long post. So today's writing will be more of a rambling series of things I feel grateful for (in no particular order). For me, each season ushers in hope and new possibilities. While winter is never the easiest season (mostly due to the darkness than anything else), I know that only by experiencing the dark can I truly appreciate the light. Just as I know that only by layering on clothes through the winter months, can I really savor the warmth of the sun on my skin in the summer. So when I see those crocuses popping their little heads up in the damp soil, or hear the chickadees singing their songs in the early morning, or hear the croaking of frogs at dusk, I know that we've made it through another winter. Spring has arrived and I find I am in a more hopeful place, and being in a more hopeful place makes my steps lighter on the journey. 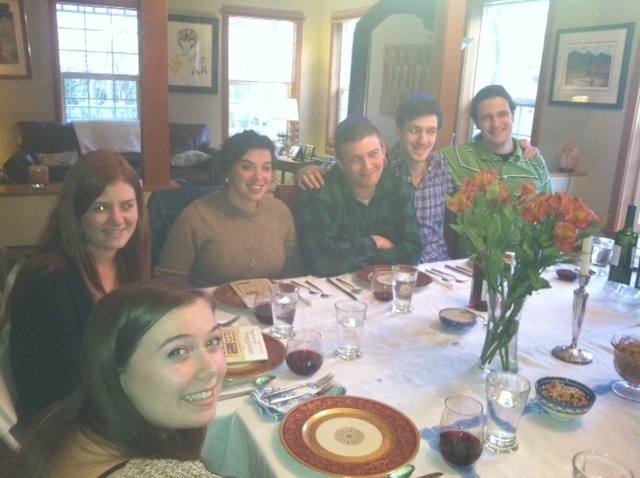 The coinciding of Passover and Western Washington University's Spring break made it so that both my kids were able to come home for the Seder. 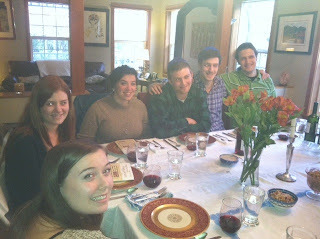 For the first time since Matthew died, I felt ready to host a Seder, and thirteen of us gathered around our table to tell the age-old story. There is nothing like longtime friends sitting together with the ease that comes from years of friendship. As my friend Kellan said "The story and experience of Passover always reminds me how deep joy and sadness coexist, how we can't know one without the other, and I seem to relearn that same lesson anew every year, in a new and different way." This is so very true. As I looked across the table at the capable, young adults seated there-aged 19 to 25-I was struck by how quickly life passes by. Wasn't it just yesterday that we gathered for Seders where the kids could barely sit still long enough to get through the first cup of wine (or grape juice)? Now they are in college and beyond, setting out on their own journeys, no longer tied to ours. How did that happen? Where did the time go? The Deepak Chopra 21-Day Meditation Challenge was over on Sunday and it, as I had hoped, provided the necessary framework and "kick start" I needed to incorporate a daily practice of meditation into my life. From day one, I was hooked and found I looked forward to starting each day with a guided meditation from Deepak. Now, two days on my own, I find that I continue to want to begin my day this way so that I can start it refreshed and more balanced. It helps remind me to be grateful for what I do have and choose to live with an open-heart awareness. I hope I can keep it up. I'm very excited to once again be a part of a writing group. This one is especially poignant in that it is made up of bereaved mothers, most of whom I have met since I have been on this journey. While we are all at different stages, we all feel like we have a story to tell. I so look forward to meeting with this amazing group of women twice a month (thank you Reba, Karen, Teri and Stefanie for being a part of my life). A couple of months ago, I began co-facilitating a grief support group that meets twice a month. I am not an expert by any means, but see myself as a companion to others who have experienced deep loss in their lives. I am so grateful to the participants who come together and I always walk away in awe of the courage and sheer moxie it takes to continue on in even the most difficult of circumstances. I feel I will learn much from everyone. Okay, now for something more trivial. I admit that my husband and I love to have a good show going. Right now we are almost finished with the first (and only) season of Netflix's series House of Cards. It stars Kevin Spacey and Robin Wright and is totally diabolical, dark and addicting ;-). Before this, we watched and loved Downton Abbey. In the late fall we viewed the two seasons of Homeland (loved the first season, disappointed in the second), and in October watched (and loved!) all five seasons of The Wire (truly one of the best shows I have ever watched). If you have suggestions for our next show, please send them my way! We're going to need something new very soon. For those of you who are on Facebook with me, you'll know that last week we lost our almost 16-year-old dog Edgar. 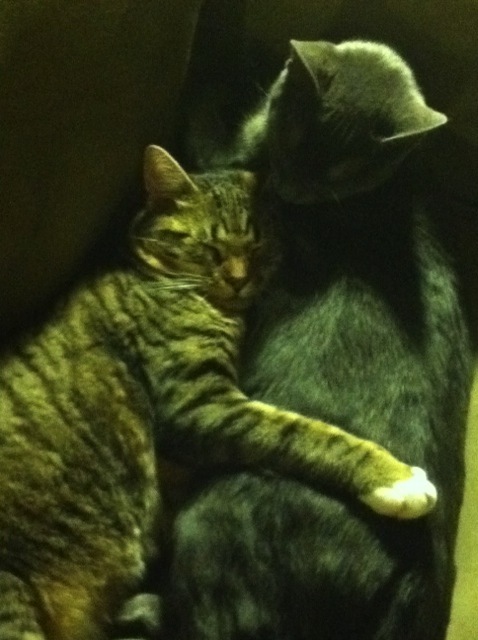 He'd been with our family since he was eight weeks old, and was dearly beloved. Both Edgar and our other dog Sierra (who died last year) are the dogs of Matthew, Jordan and Aviva's childhoods, and they have many happy memories of them. I've noticed that many of my friends are now losing the pets they had when their children were young. It's that darn passage of time that can't be stopped. However, lest you think our house is completely animal-free, you'll be interested to know that last August we picked up two kittens-Tikka and Mazzie. They are adorable, full of energy and the best of friends. I'm grateful for the cat energy that now fills our house these days. I've written before how I feel about baseball. So all I want to say right now is how hopeful I feel right now (one day into the season) as the Mariners stand at 1 and 0. That's all. So these are a few of the things that have been rumbling around my brain. Quite honestly I could go on and on, but think that brevity is my friend in this case. I will write another blog post about some books I've been reading, as I love to pass along good reads. In the meantime, I hope that spring has made its way to your part of the world, if not the actual season then the sentiment. Namaste. Thank you again, Robin. I connect with so much of what you write and appreciate your gratitude. When I am missing my children because they live in other parts of the country, I remember that I am grateful they are healthy and happy, making their own way in the world. I have also enjoyed Depak's meditation jumpstart and wondered how I had let this practice slip away. But, I will be rooting for my Texas Rangers this year again, even though they did not have the good start the Mariners did this year. Thank you for reminding me there is so very much to be grateful for today. Thank YOU Theresa. So glad you enjoyed the 21-Day Challenge too. We'll have to check in mid season on the Rangers and Mariners (although if past seasons are any indicator, my initial feelings of hope may well have given way to feelings of despair). Play ball! This made me smile. I just love your energy, truthfulness, positivity and your willingness to face the shadows, as well. Why a blog about grief and gratitude? Can these two seemingly disparate emotions be linked? I think they can. When we lost our 21-year-old son Matthew to a form of virulent strep in October of 2010 my life was profoundly changed. I am not the same person I was and this loss is an integral part of who I am now. Seventeen months later, I feel like my soul is beginning to breathe again and I see the world through softer eyes. And that’s what this blog is about. It’s about the transformational power of grief, and the resulting consequence of gratitude for all of the little things that constitute my life today. By acknowledging and appreciating life’s impermanence, I am left with deep gratitude for what is right now. So I dedicate this blog to Matthew with love and appreciation for the 21 years we had him in our lives. His memory is a blessing to all of us. The miracle of gratitude is that it shifts your perception to such an extent that it changes the world you see.